The Thunderbird 500 has been perhaps one of the most anticipated offering from the Royal Enfield stable considering that the Thunderbird 350 has been doing yeoman service for the last ten years. The Thunderbird has built for itself a reputation of being a comfortable touring motorcycle and is often the first choice amongst the Royal Enfield models for touring enthusiasts. The Thunderbird has earned itself the reputation of a capable highway tourer and established itself firmly in the cruiser market. 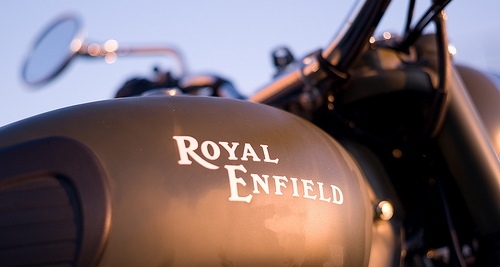 The Thunderbird broke away from the mould of Royal Enfield’s traditional motorcycles and redefined a new lineup. In that direction, the new Thunderbird has come as fresh motorcycle. 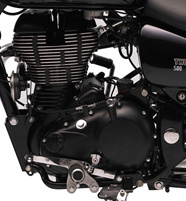 The ‘black’ engine is one of the first styling elements that catch your attention the moment you see the motorcycle. The seat has been completely redesigned to suit the new foot pegs position. The handle bar too has received changes for better reach and ergonomics.The high rise handlebars, forward placed foot-pegs and a low seat height enable a rider to cover distances comfortably for longer periods of time. Other small styling elements that a keen enthusiast will notice are the Royal Enfield logo on the all new foot-pegs, new design mirrors. The seat now opens using a lock mechanism, accessible through the side panel. True to its design concept as a more touring friendly motorcycle, the separately mounted pillion seat can be removed to accommodate luggage. 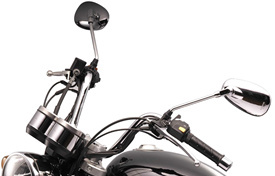 The pillion grab rail is an all new pressure die cast component and lends to the modern design of the motorcycle. Bungee hooks provide the much needed bungee points to tie luggage. Since Royal Enfield's are mainly associated with tour and leisure purpose and to tackle this issue Thunderbird 500 comes equipped with a massive 20-litre fuel tank for an enhanced range. The designs are now oriented to the cruiser character of the motorcycle. The seat has been completely redesigned to suit the new foot pegs position. The handle bar too has received changes for better reach and ergonomics. The seat now opens using a lock mechanism, accessible through the side panel. True to its design concept as a more touring friendly motorcycle, the separately mounted pillion seat can be removed to accommodate luggage. 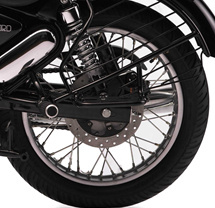 The pillion grab rail is an all new pressure die cast component and lends to the modern design of the motorcycle. Bungee hooks provide the much needed bungee points to tie luggage. Night time visibility has been the biggest challenge faced by most motorcyclists while cruising on the highway hence the new headlight with a 55w projector lamp for its low beam and a 55W halogen bulb for the high beam addresses that issue. The lighting is at its brightest with the high beam on, working in combination with the projector lamp giving ample spread and penetration on the road. Tail lamp comes with LED lamp with position light guides which is new for Royal enfield family. The bike comes loaded with front 280mm Disc, 2-Piston caliper brakes. 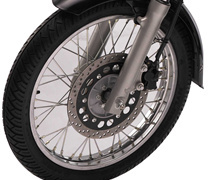 Stopping power has been aided with the addition of a disc brake at the rear. The braking system is supplied by Bybre, a fully owned subsidiary of Brembo. It is mounted on the new improved oval section swing arm. These changes will enhance the riding experience of the motorcycle on the highway. The price of the Thunderbird 500cc is expected to be ten thousand higher than the Classic Chrome which makes the bike the flagship motorcycle of Royal Enfield’s portfolio. Finally! Looks real meaty. A worthy big brother to the TBTS 350.
i was waiting for this kinda bullet.... Royal enfield launch it soon !! but havent declared its mileage... i think it is awesome waiting for it..